There is a new trend among those who preserve their wedding gowns. Some brides are re-defining what to do with their wedding dress after the wedding. 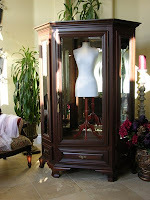 Instead of packing it away in a closet or under the bed, they are putting their cherished gown on display. Here are a couple examples. At nearly $15,000 this is the ultimate way to showcase your gown. This is a piece of furniture meant to sit in your living room or entrance hall. If you are going to have your own version made, make sure the case has glass that will protect your gown from the UV rays that will damage your dress. Please make sure you have the dress professionally cleaned before you put your wedding dress in a case like this – unless you want to watch your gown yellow over time. Another way to showcase your gown, is to place it on the wall. In September of 2011, Adrienne Maloof tweeted a photo of her wedding gown in a frame. Here Adrienne shown sitting in front of her gown on “The Real Housewives of Beverly Hills” (airs on Bravo). Again, you’re going to want to use glass that blocks the harmful UV rays if you have your own version made. What other types of bridal displays have you seen? Would you frame your gown? Talk about it in the comment section!